Coventry City Football Club has very humble beginnings dating back to October 1883, when a group of workers from Singers Cycle Works in the Hillfields area of the city, headed by William Stanley, set up a works-based football team when their previous club, Coventry Association, folded. Singers FC as they were known struggled to compete in their early years, joining the Birmingham League in 1894 and frequently moving ground, playing at Dowell’s Field, Binley Road (1883-87) and Stoke Road (1887-99). In 1898 the club changed its name to Coventry City F.C., and a year later they moved to a more permanent home in Highfield Road, where they would remain for the next 106 years. Much of the time since has been spent struggling both on and off the pitch. This has included a few relegations (dropping into Southern League Division 2 in 1914, Division 3 in 1925 and even as low as Division 4 in 1958-59) as well as nearly going out of business completely at the outbreak of World War I before being rescued by David Cooke, and officials of the club being found guilty of fixing a match against Bury in 1919/20, their first season in the Football League. But there have been highs along the way. In 1909 the club (which was still largely amateurish at the time) reached the FA Cup quarter-finals. The promotion back to Division 2 in 1936 and looking on course to reach the top flight until World War II stopped them in their tracks is another high point, with the entire Harry Storer-era of the 1930’s being considered a golden age for Coventry City. Clarrie Bourton was the talismanic forward in a free-scoring attacking team, and with 182 goals remains the clubs all-time leading goalscorer. 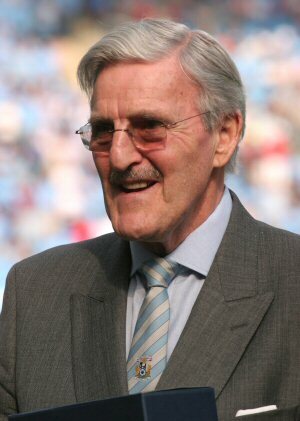 Post-war the club entered the doldrums again and slipped down the leagues, but this ultimately brought about the appointment of the charismatic Jimmy Hill in 1961, who changed the club from top to bottom, and was responsible for the Sky Blue kit and nickname and the famous club song Play Up Sky Blues, based around the Eton Boating Song. That didn’t stop the club reaching Europe in 1970/71, and Coventry were the only team to beat eventual winners Bayern Munich (including Franz Beckenbauer and Gerd Muller) in the Fairs Cup that year (despite losing heavily on aggregate). The same year also saw Ernie Hunt and Willie Carr’s legendary donkey kick free-kick, which was outlawed after the game and will never be repeated. But by far the greatest day in Coventry City’s history is May 16 1987 when, managed by John Sillett and club legend George Curtis, the club finally won some silverware, winning the FA Cup 3-2 against Tottenham in what is described as one of the best finals ever seen. David Bennett and a sublime diving header by Keith Houchen twice brought Coventry back on level terms before an own goal off Gary Mabbutt’s knee in extra time helped the Sky Blues shock their illustrious opponents and the football world in general, with skipper Brian Kilcline hobbling up the Wembley steps to proudly lift the trophy aloft. For 34 years the Sky Blues steadfastly refused to relinquish their place at the top table despite numerous relegation battles, becoming the 4th longest serving members of the top flight behind Arsenal, Everton and Liverpool and becoming founder members of the Premier League in the process. It led to the phrase “if the Titanic had been painted Sky Blue it would never have gone down” but this record was made with a highly contentious 2-2 draw with Bristol City in 1976 after a late kick-off allowed both teams to know that the draw would be enough to keep them both up. But in 2001 the club finally dropped out of the top flight after some high risk gambles by the overly-ambitious Bryan Richardson failed to pay off, and the high transfer fees paid out and his desire to build a new stadium left Coventry City with debts of around £60m and on the brink of going out of business. The club struggled through the next five years, moving into the much smaller than envisaged 32,609 seater Ricoh Arena in 2005 (but only as tenants) and despite the much improved facilities the ground has yet to be adopted as ‘home’. 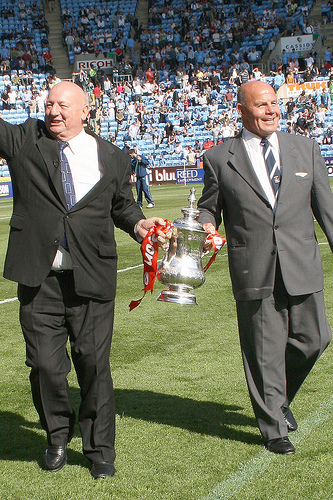 2007 saw the profligacy of the 1990’s come to a head, with the Sky Blues 30 minutes away from administration before being bought by investment firm SISU and ex-professional Ray Ranson. Even so the club has since still failed to be particularly competitive thanks to a blend of poor tactics and limited investment in the squad and the club find themselves once again at a crossroads…. The server last rebooted 84 days, 6 hours, 27 minutes, 13 seconds ago.